This article illustrates 6 of a total of 13 Clovis points that were found in the Drake cache. These 6 examples are in the collection of the Smithsonian Institution. They were discovered in 1978 by Orivlle Drake in a wheat field in north central Colorado. Only seven or eight Clovis caches have been discovered to date and the Drake cache is one of the smaller caches. This cache is famous for its many colorful Alibates agate Clovis points and their superb quality of workmanship. "What all caches have in common, regardless of their components, is that the artisan buried them".-----2001, James M. Chandler, "lithic Caches", Mammoth Trumpet Vol. 17, No.1. "Sometimes, though, a cache is found that's a collection of exquisitely finished projectile points and tools, splendid examples of the craftsman's art".-----2001, James M. Chandler, "lithic Caches", Mammoth Trumpet Vol. 17, No.1. The Drake cache was found in a Colorado wheat field by Orivlle Drake in 1977. On the first day of discovery on April 11, 1977 he was with his friend Merlin Bondhus when he found three Clovis points. Farm equipment had scraped the top off the cache, breaking three points, and scattering them on the surface. The main part of the cache was discovered sometime in the following month of May when he returned with two friends, John Myers and Jimmy Hyde to probe the site for more Clovis points. They succeeded in located the main cache and described the find as----"the points were lying close together and parallel to each other "like they were in a bundle". 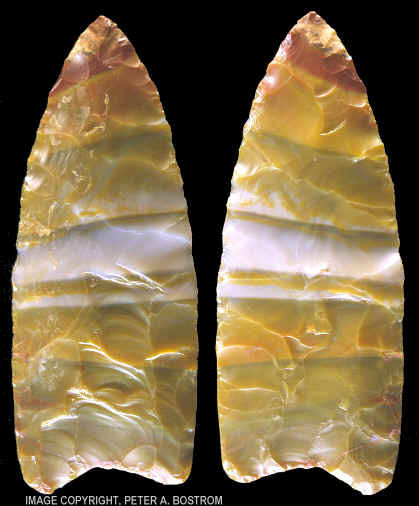 This Clovis point was found on the Drake Clovis site located north of the South Platte River in north central Colorado. It's one of the most colorful Clovis points ever found. Clovis caches are known for the colorful and high quality lithic materials that were used to make them. Even optically clear quartz crystal was used to make at least one of the large bifaces in the Simons Clovis cache. This Clovis point is made of a rare form of Alibates agate and it measures 3 1/2 inches (8.8 cm) long. The 13 Drake cache Clovis points range in size from 3 1/2 inches (8.9 cm) to 6 1/2 inches (16.5 cm) long. Eleven of the points are made of Alibates agate from a source located over 300 miles to the south in the Texas Panhandle. One is made of Edwards Plateau chert from Texas and one is made of White River chalcedony from a source in western Nebraska. 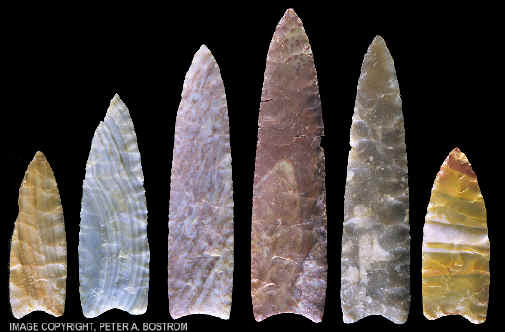 Clovis people were living a nomadic life style and their extensive travels can be traced from the wide variety of lithic materials they left behind.